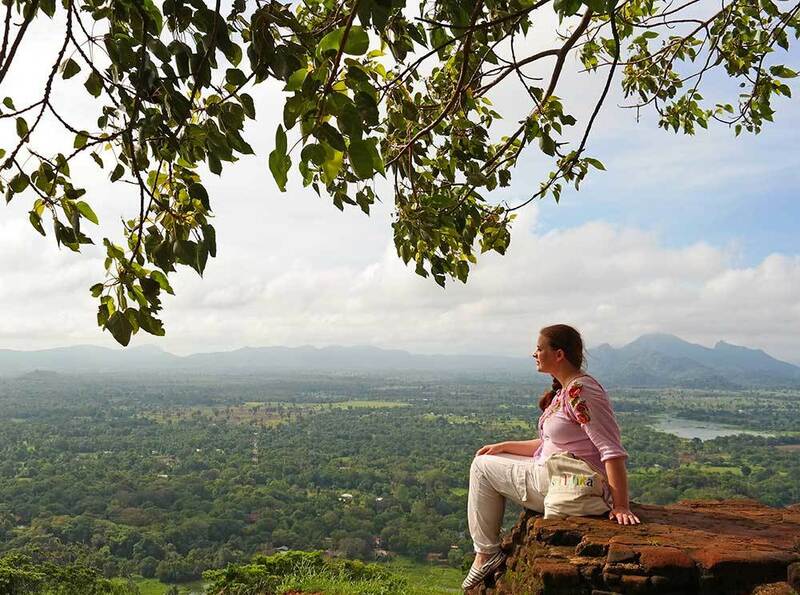 Here is a picture of me on the top of the Sigiriya Rock. Read why this photo of me signifies so much more to me — and what you can learn from it too. Photo by Noel Morata of Travel Photo Discovery. 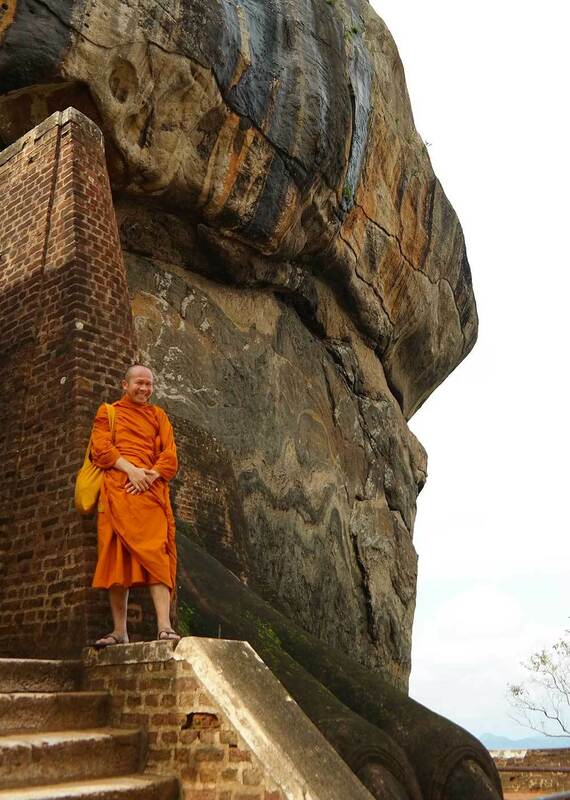 While visiting the Sigiriya Rock in Sri Lanka is something I highly recommend, you don’t have to travel to the other side of the world to draw inspiration from it. 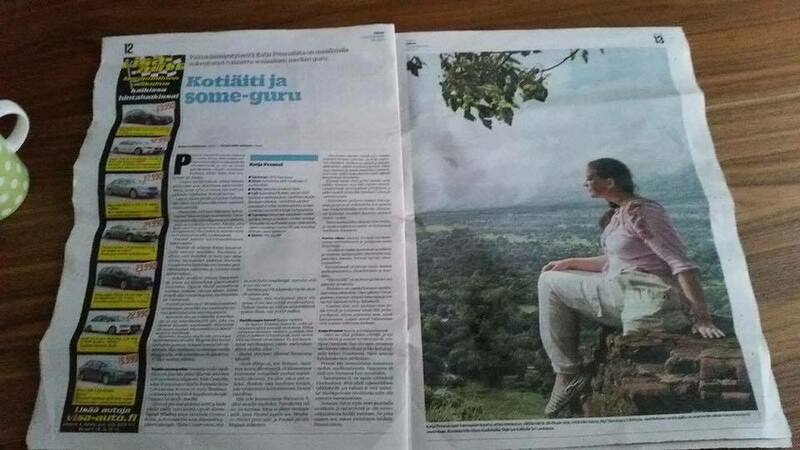 I was interviewed for a Finnish newspaper Turun Sanomat about Skimbaco, social media, my online business and well “success.” The interview was published today. They asked me to provide a “business head shot” for the interview, which run in the business section of the newspaper. I have lost a lot of weight after visiting Sri Lanka 14 months ago, and could have taken a professional head shot, more suitable for a business article (I guess), and much more flattering. But I didn’t. In fact, I was almost rude, and refused. Because this one page photo on the newspaper signifies so much more than any other picture of me could have ever done. This photo was taken on my business trip, I was in Sri Lanka attendeding the Professional Travel Bloggers Association’s conference there and later on even sold a story about Sri Lanka to be published on Huffington Post, which ended up being one of my most read posts I’ve ever written on HuffPo. I was terrified of climbing the stairs up – but so proud of myself when I did it. Many people climbing it with me thought it wasn’t a big deal, because they had climbed higher mountains, and without the staircase! The photo also tells a story of my “day in the office,” I have created a business of living life to the fullest, and creating a lifestyle for me where I can challenge myself and enjoy things like world travel as part of my work. Most “digital nomads” are young, not many have children, and even the families who travel, usually do the travel blogging (or the digital business) together. I created my business on the side, alone, while being a housewife, stay-at-home-mom and moving from country to country. 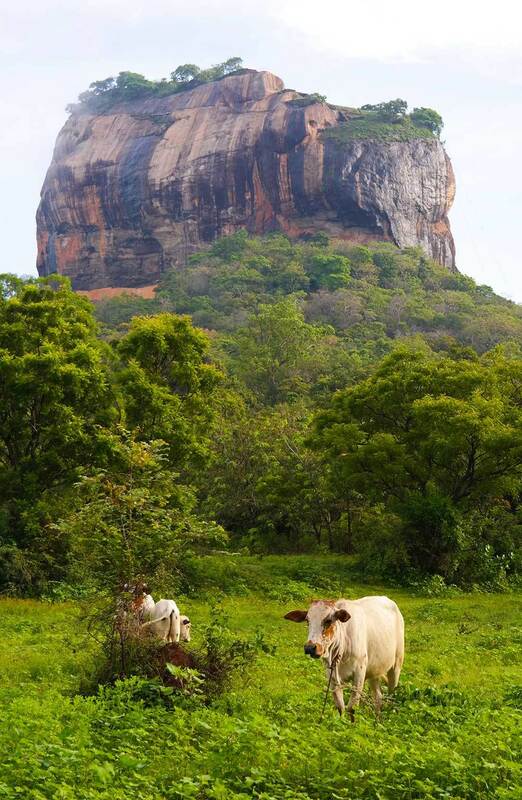 Let me tell the story of Sigiriya Rock in Sri Lanka, also called the Lion Rock, a UNESCO listed World Heritage Site. 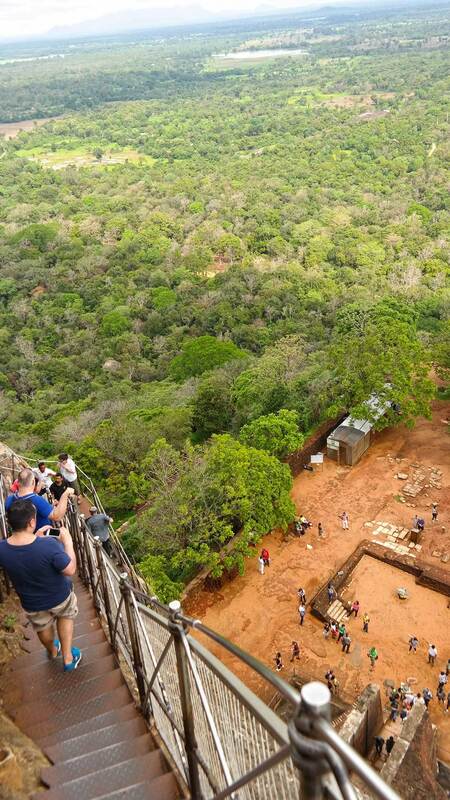 King Kasyapa (477 – 495 CE) chose to build his capital on the top of the Sigiriya Rock, a column of rock nearly 660 feet (200 meters) high, where it was difficult to access, and easy to guard. 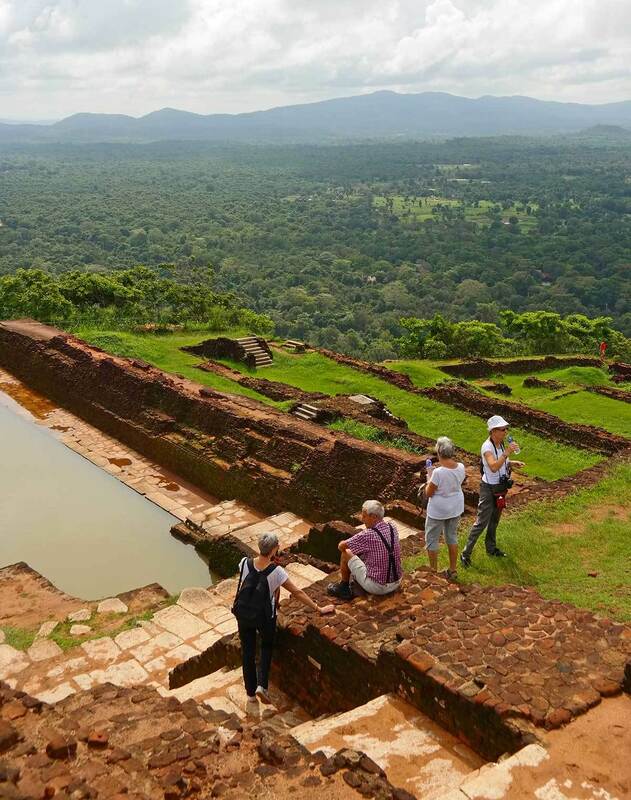 We might not know the real story behind it, but Sigiriya is considered to be one of the most important urban planning sites of the first millennium, and the site plan is considered very elaborate and imaginative. On a small plateau about halfway up the side of this rock he built a gateway in the form of an enormous lion. One side is decorated with colorful frescoes. One side of the wall is called the mirror wall, it is covered in highly polished white plaster, and rumored to be so shiny the king could see his own reflection on it. 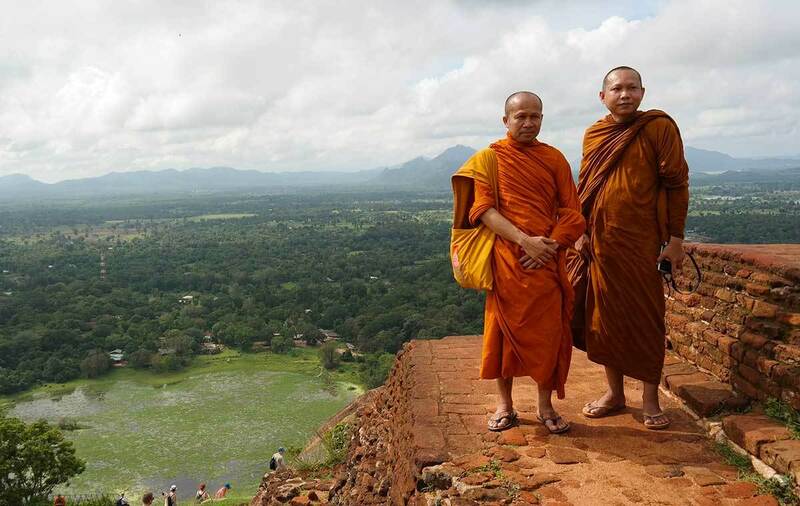 The capital and the royal palace was abandoned after the king’s death, and it was used as a Buddhist monastery until the 14th century. Today, there is a staircase on the side of the rock, and you can easily walk the over 1000 steps to the top of the rock. But it is not as “easy” for all. Especially if you are terrified of heights, like I am. The stairway is narrow, and there is only one stairway to go up and come down, and you need to let people to go by you, when they pass you going to the other direction. And this is the most visited tourist attraction in Sri Lanka, so be prepared that it can be many people sharing the steps with you! That’s not all. 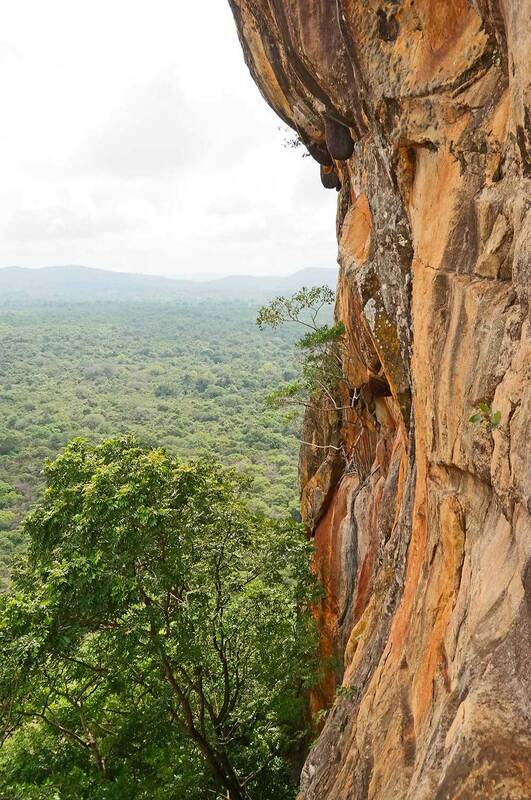 On the side of the rock wall, there are huge hornet’s nests (look closely in the picture, you can see them on the top part of the photo), around 5-6 feet (up to 2 meters) high. At times the hornets get excited and fly around (and attack) the people climbing the stairs close by. Then the stair-traffic stops, everyone kneels down and hopes the hornets fly away. In reality it is a lot of screams, prayers and people trying to stay calm, but with panic slowly creeping in the crowd. I didn’t hear any horror stories though… maybe the fear was all in my head. The climb is so worth it. It is worth for the view, and worth for feeling the “I did it,” despite the fears of heights or the hornets. 1. Be proud of each mountain and hill you climb. We all climb high mountains, heck, sometimes they can be just small hills, that leave us tired and breathless, but often proud that we made it up. There is a lot of sweat, even tears, hard work, and well, several steps to reach the top, and most of this sounds like the cliché talk every single life coach and motivational speaker tells you. It still doesn’t mean it is not true. But some mountains can be easy too. 2. Don’t let others tell you what is or should be a big deal for you. 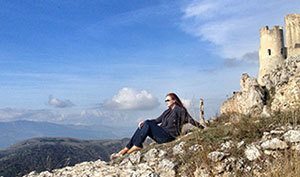 While the pictures of a person standing victoriously on the top of the mountain might be such a cliché, what most people don’t talk about is that the “top of the mountain” looks so different for all of us. Sometimes it’s coloring your hair blue – sometimes it can be learning to walk again after a horseback riding accident. 3. Do not let other people define your success. Read this carefully: it does not matter how high your “mountain top” is. It does not matter what other people think of it, and even if it is easy for them to climb it. Do not let people define your success, and dim your celebration when you reach milestones on your path. 4.Use your disadvantages in your advantage. Have patience, and guts when you carve your own path defining your own “mountain tops.” Use your disadvantages in your advantage and instead of trying to hide them, learn to make them the strongest advantage you have. Ask for help when you need it, but have some reservations when people are helping you. Remember that sometimes they think your success should look something different than what you actually want. 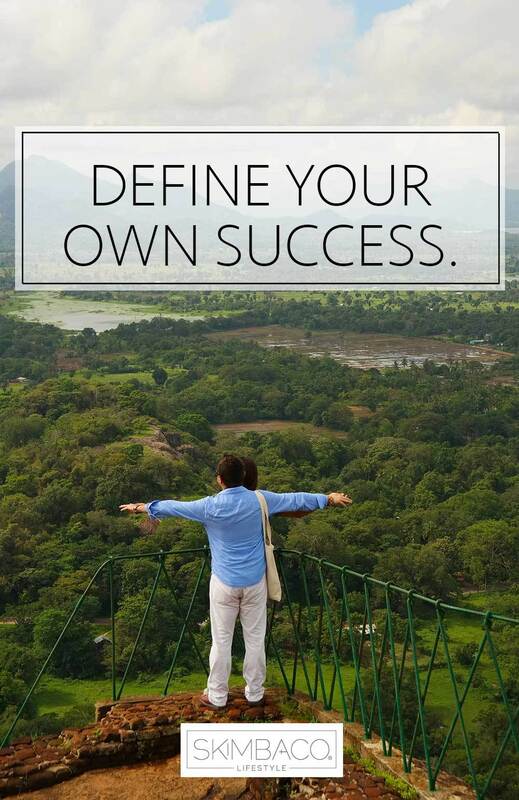 Your success starts with you. 6. Have a good plan. Plan your steps carefully, but more importantly, ask yourself where you are going and why. When selling products online was my business, I defined success by the number of orders I got each day. The more successful = the more orders I was packing. Same happened with my consulting business. The more successful = the more consulting hours I was doing. I learned that I was very, very bad at planning my business. My success was defined by me working more and more hours, instead of planned in a way that I could enjoy more life. 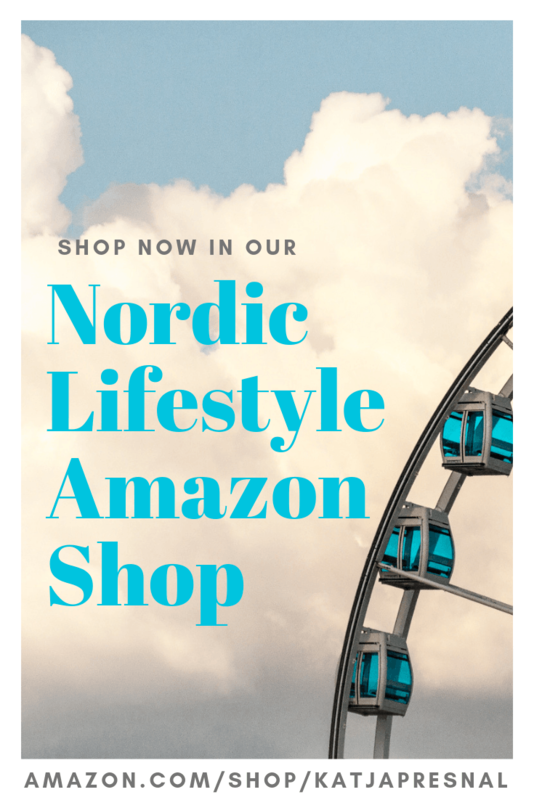 Now I have finally figured out a way to make passive income, with my blog and also with Young Living essential oils (read more about my Enjoy Life with Oils team). 7. More importantly: know what’s your goal. They say be careful what you wish for, and for a reason. The real question isn’t really HOW to climb the mountain top, and how to make your dreams come true, but the real questions really are WHAT you want, WHAT is your mountain top, and how do you define your success. Figuring out the way can sometimes be the easiest part. But it can be frustrating to reach your goals only to realize it wasn’t what you wanted. Take the shortcut when you can. Sometimes there are stairs built to the top (like at Sigiryga, and I feel the same way in a network marketing business, all the tools and how-to’s are available to me), and there is no shame on taking them. But you do need to know what you are passionate about, and WHY you want to reach certain milestones. Otherwise, you will be like all of those people who have climbed on the top, and felt it didn’t fulfill them at all. 9. Don’t get discouraged if others won’t join your path. When you are excited about going on the top, and you want to invite everyone to join you, remember that it is perfectly fine when they say no. Even if you have found your passion, and think it would be great for your friends too, accept that it is not for everyone, or it can be simply a bad timing in their lives. Maybe they want to sit out of it for now — or forever. But don’t let it slow YOU down and keep YOU from achieving YOUR dreams. 10. Sometimes all that buzz is… just buzz. There can be buzzing bees around you, but it doesn’t mean anyone is going to sting you. This can be good – and bad. Good that you won’t get hurt! But bad because sometimes you can have good PR, lots of people talking, many followers, many potential clients, many “almost” situations… but it’s all buzz, not biz. 11. When you hang out with the bees… there will be buzz and honey. But I guarantee you: if you stir up a hornet’s nest enough, eventually you will be stung! If you make same mistakes often… eventually they will turn into big ones. If you keep up working hard on the buzz, the BUZZ will turn into BIZ. 12. Tell your own story. Lastly, a lesson from King Kasyapa — make sure you tell your own story enough many times to people so they know how you built your “empire on the mountain top.” People talk anyways, so DO the things in a way that you can be proud of yourself and then tell them the real scoop! For more… subscribe to my newsletter. Can I help YOU to climb and find your “mountain top?” We welcome guest writers, and are looking for new Skimbaco team members and business builders for our Young Living essential oils team. I also own Presnal5 marketing agency and we hire marketing freelancers for projects. Thanks for sharing this! I was there some weeks ago. Incredible view and nature.. I love this. The scenery is breathtaking and the lessons you learned from it are so inspiring. I’ve been in a bit of a funk because my website has been down since Saturday, so I’ve had to listen more on social media instead of pushing my posts out there. Eye opening. I hope you get your website working soon!!! But I am a big believer that you need to live even the sucky parts in life to the fullest, and it’s great that you have used the time in your advantage! You chose to take the best out of it! What an inspirational post, I loved everything you give and in such a positive way to look at your direction in life, great job. Thank you Noel! And thank you so much for the photos! !